We will be very happy to share with you our love of Paris, and our clear and quiet large apartment. we like to make you feel comfortable, as if you were "at home". We are able to be with you if you need something, or if you like to speak with us, and we are able to "disappear" if you like to stay only with your family or friends in the lounge. 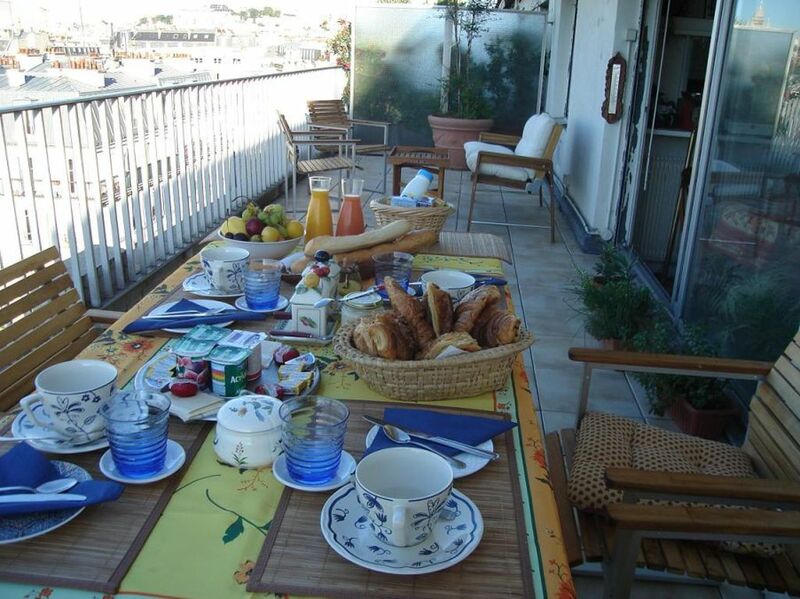 When it is warm enough, the large terrace is a very nice place to rest, or have breakfast. We like to meet our guests from everywhere in the world ! A lot of positives points : see sight on Paris, on Montmartre/Sacré Coeur from the terrace, the privacy of each room, because of two doors : one door to close the room, and a second door to close the "night-corner" including bathroom or shower room and toilets. Very good beds, the apartment which is large and sunny, the metro station next door (a metro line with which it is easy to go everywhere in Paris). raisonnable rates for Paris ! lounge, with free coffee, tea, fresh drinks for 1 euro. TV is In the lounge. Thank you to our hosts this is the first time we have stayed in an Airbnb what an experience. Huegette and Roger were the kindest people we were able to have our son and daughter in law for a meal both nights just perfect. Very easy to closest Metro and we walked from Gare du Nord took about 20 minutes when we arrived. Our breakfast was a breathe of fresh air freshly baked croissants, yogurts fresh baked bread and jams and the most amazing cheese and tea and coffee yum yum. What an experience 10 out of 10. Great place with a beautiful view! Amazing hostess! Even though we speak no french, we felt right at home, Hugette was very helpful and welcoming! She did her best with English for us and made us an awesome breakfast! Host asked us what time we would like breakfast every morning and sure enough it was wonderful andready for us at that time. Her apartment was very nice and clean. Thank you for everything!! It was a terrific stay a short walk from the Marx Dormy metro station. Superb breakfast, comfortable flat. Lovely view from the balcony. The hosts are welcoming and flexible. If you fancy a run at 6am I recommend taking the Rue Pajol up to Rue De L'Evangile, over the busy crossing to Rue Curial, over the canal and along the Quai De LA Charente into the La Villette park complex. Then explore the various routes in and around the park. A great start to the day. Don't miss breakfast though. We got two day passes on the BatoBus which are a great way to rest your feet and take in the city from the river. A great pied-à-terre for short or long visits. Huguette was a great host. Huguette was very kind and helpful, a great breakfast each morning to send us off on our days plans. not far from "boulevard périphérique", exit "Porte de la Chapelle". Métro station : Marx Dormoy, bus direct (number 65 or 35) from railway station "gare du Nord" et "gare de l'Est"